On Friday 2nd June 2017 at 7:00 p.m. we will hold a free public talk on the 2017 story of the Peregrines at St George’s. 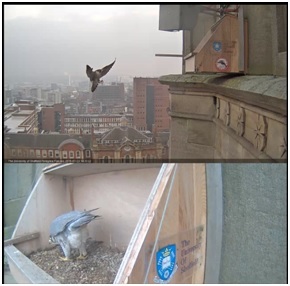 The talk will last an hour and will take place in the church itself, and will be preceded by a Peregrine watch outside, which will be close to the date that the juvs are expected to take their first flights. The talk will consist of contributions from Debbie Dawson and Natalie dos Remedios (Dept of Animal and Plant Sciences at the University of Sheffield), Dean Rea (Sorby Breck Ringing Group) and David Wood (Sheffield Bird Study Group) on different aspects of the project. 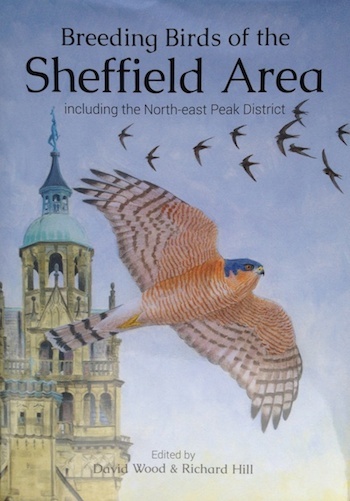 For those who want to know more about the Peregrines, and other species in the Sheffield area, the recently published SBSG Breeding Atlas contains details of how Peregrines have fared as a breeding species across our area in recent decades, and the 2012 SBSG annual report has an account of the first breeding success. Both can be purchased via the SBSG website. The first organised Peregrine watch will take place at St George’s later in the breeding season, though observers will often be at the church to keep an eye on progress if you do want to pop down to see the birds for yourself. Please keep checking this page for details of forthcoming events. Watch this space, or the SBSG website, for more announcements. Any chance that to have a recording of this talk afterwards? My parents are totally hooked to the webcam but live 1400 km too far away to attend. Yes – the University are planning to record the talks. I only live in Totley but am really annoyed to have to miss the meeting due to a prior engagement. I’d love to be able to get a recording too, I presume you’ll tell us how in due course. Thanks again to all concerned for bringing such good quality pictures and interesting info. over the last 10 weeks. I shall really miss them when they finally go.